Veliko Tarnovo is a very picturesque city in North Bulgaria and quite a popular tourist destination among the Bulgarians for a long weekend. As the city has a rich cultural and historical heritage, it is also included as a must-see in the school curricula, so kids visit the city very often on field trips. Given the fact that there are many festivals and events organized, Veliko Tarnovo can be sometimes very crowded. So, finding the perfect place to stay in the city can be overwhelming, if you don’t know the neighbourhoods or the peculiarities of the city’s transport system. For 13 years I have called this city my home and there is nothing better than an advice from a local when it comes to booking an accommodation. Here are my tips and recommendations so that you can choose the best hotel for your stay in Veliko Tarnovo. Location – is the hotel at a walking distance from all attractions? Is it close to a bus stop and is there convenient transportation to the city centre and the attractions? Price – in what price range is the hotel and what extras does it offer. Here we rely on the stars the hotel has. Character/View – if this is important to you, it can be a major criterion for choosing the right accommodation. Time of the year – there are certain periods of the year when prices go up or when hotels could be fully booked, so it’s better if you avoid visiting the city. When choosing the right neighbourhood, you should be considering whether the hotel is close by museums/attractions, restaurants and other facilities, or whether there is easy access to public transport and/or taxi services. As the city is built on hills and the Yantra River meanders through it, if you choose for a hotel off the main street, you should be prepared to do some walking up or downhill in order to get to the main street, where all shops, restaurants and bus stops are located. Due to its special, but totally picturesque location, the city has a bit of an awkward public transport system, as in the city centre there is only one street with public transport. Well, this shouldn’t be much of a worry, because there are many taxis at affordable prices, which will bring you anywhere in the city for less than 5 EUR. The most popular type of accommodation in Veliko Tarnovo is the guest house – these are small, family-owned hotels, mostly with up to 2 stars. In general, they have a range of double/triple bedrooms and apartments/studios. The rooms can be booked separately or the whole house/apartment can be rented. Most of the guest houses are referred to as hostels, although they are not offering large dorms, but private rooms with a shared or en-suite bathroom/wc. There are some 4-star hotels in the city, but most of the hotels have 3 stars. There are no 5-star hotels. 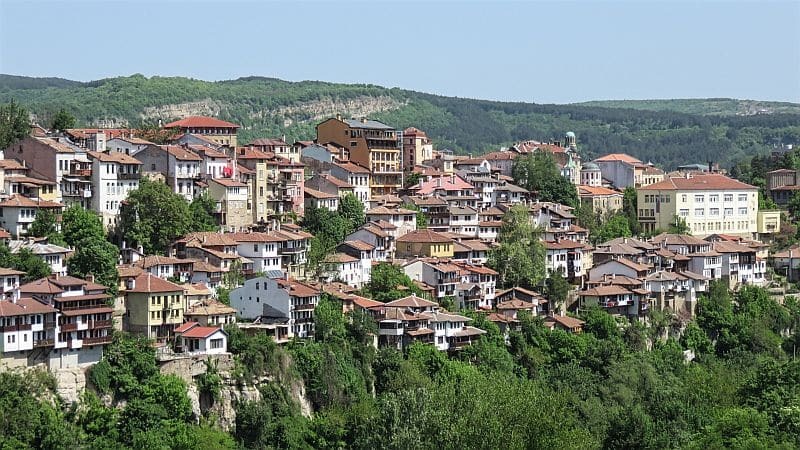 Tip: Are you already considering visiting Veliko Tarnovo? Then you might find handy my complete city guide of Veliko Tarnovo with information about what to see and do in Veliko Tarnovo, as well as recommendations for day trips from Veliko Tarnovo. 24 – 26 December – Christmas Holidays – perfect for a longer stay in the city. You can't deny that this is one of the most picturesque views you have ever seen - Veliko Tarnovo has it all! Not much popular as a travel destination internationally, but very much loved by the Bulgarians for a weekend getaway. Here are my recommendations for accommodation in Veliko Tarnovo. Click on the name to see the reviews and check the prices. You can also find the exact location of the suggested hotels on the Google maps below. DISCLOSURE: This post contains affiliate links. If you book your stay via one of these links, I may earn a small commission at no extra cost for you. This is helping me to maintain the blog, so that the access to it is free of charge for everybody. Thank you for contributing to the existence of this blog! These hotels are marked in purple on the map below. They are close to all museums and attractions, but you you need to walk up or down to the main street, where most of the restaurants are located. I am sure you will love this street - as if you step back in the past. Not to mention that it's also very romantic place. Gurko street is the perfect stroll on a Saturday afternoon - traditional houses, cobbled stone and this amazing view to the River Yantra and the Horsemen. These hotels are marked in green on the map. The main street is the only street with public transport in the city. Most of the restaurants and the shops are located there. Tip: Ask for a room with river view. As those hotels are built on the hill, on the street side they are 3 or 4 stories high, and on the river side they get like 4 or even 6-8 more stories. Hotel Stambolov – a guest house, 2 stars. That’s my favorite place in Veliko Tarnovo. Check out why I always choose to stay at this guest house. These hotels are marked in blue. These hotels are at about 15 – 20 minutes walking distance from the city centre. There are a few restaurants in this neighbourhood, but walking to the centre where all restaurants and shops are, is not a big deal. You can always take a taxi or the bus. Tip: What is so special about Tsarevets and why everybody wants to stay in this neighbourhood, you can read in my complete guide to this medieval fortress. Grand Hotel Yantra – a 4-star hotel with an indoor swimming pool and a spa centre; amazing views to Tsarevets & Trapezitsa Fortresses. Ask for a room with a view and you won’t be disappointed. Hotel Studio – a small 3-star hotel with a terrace with amazing views to Tsarevets Fortress. Ask for a room with a view to the fortress. Boutique Hotel Tsarevets – a 3-star hotel, located at only 100 m from the fortress. There are a lot of restaurants and shops in this neigbourhood. For all hotels that are not on the main street you should be prepared to walk up or down. Tip: If you are not happy with going up or down hill, or if you are with reduced mobility, choose for a hotel on the main street. Remember that up or down hill means slippery roads in winter and in the summer when it’s very hot, you might need to stop and catch your breath. Interhotel Veliko Tarnovo – a 4-star hotel with the most amazing views. Ask for a room on the river side. Sky Hotel – a 1-star hotel at the edge of the city. You will need to take the bus or a taxi to go to the city centre and/or to the attractions/museum. However, the city’s only shopping mall, cinema and a bowling centre are within a walking distance to this hotel. Park Hotel Asenevtsi – a new hotel (built 2015), just outside of the city with a big outdoor swimming pool, 15 minutes walking distance from the city centre. If you are following my blog, you will probably know by now that I have two criteria when choosing a hotel – location and character. Can I compromise on them? I don’t think so, but I can add a third one that is also very important for me – view. Waking up in a room with a view is priceless. This is exactly what you see when you open the door to the balcony in room No. 1 in Guest House Stambolov in Veliko Tarnovo. Clouds, however are not guaranteed. Location – perfect! The hotel is on the main street in the old town. View – priceless! Just check it for yourself. Isn’t it amazing? Price – a double room with with en-suite and a view costs about 25 EUR per night. We had stayed only in a double room, but the guest house offers also single, double, and triple room apartments and a studio. There is a 24/7 reception desk service. The guest house doesn’t offer breakfast, but just across the street there’s a lovely café where you can go for breakfast. The only downside of the hotel is that they don’t have a lift and the stairs are quite steep. So, consider this if you are with limited mobility. Guest House Stambolov as seen from the river side. There are 3 stories from the street side and 6 stories in total from the river side. This is typical for the architecture in this city. Imagine waking up each morning with the most stunning view in the world. It's possible - visit Veliko Tarnovo. Have you stayed in one of the hotels? Share your experience with the readers of this blog and help them make the best choice! Did I miss a hotel which you think should be included in the above overview, let me know in the comments? Bulgaria can be such a charming country! We did experience quite a few weird looks from locals, when we visited Sofia a few years ago, as if they really weren’t used to tourists ..
You are quite correct. There are still buses with tourists that come and go, but there aren’t many independent travellers. Very informative post with so much details and tips. Thanks for sharing. This is such a thorough guide! I’d not heard of Velko Tarnovo before this post but if I ever visit Bulgaria it sounds like someplace I’d want to see. Thanks for sharing!